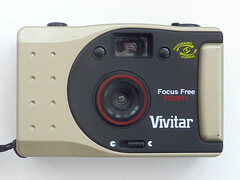 The Vivitar PN2011 is a 35mm fixed-focus panoramic camera marketed by Vivitar. 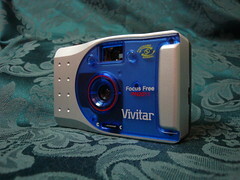 The low-quality, plastic camera has a 28mm fixed-focus lens, fixed shutter speed of 1/125 and aperture of f8. It is generally considered to be a toy camera. The camera's panoramic mode crops the 35mm frame to a panoramic aspect. This mode is optional, and there is a switch on top of the camera for normal or panoramic mode. It is not considered a true panoramic camera by some since the resulting frame is merely cropped vertically but is not any larger horizontally than a conventional 35mm frame. 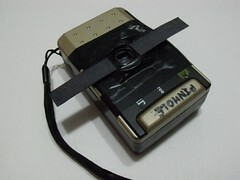 This camera remains very popular because it's inexpensive, needs no batteries, and is easy to disassemble and modify. 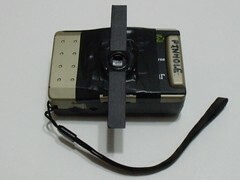 Common modifications include conversion to a pinhole camera, adding bulb mode, adding multiple exposure capabilities, and reversing the built-in lens to get fisheye-like results. Other methods of fisheye conversion include replacing the lens with a door "peep hole" security lens, or adapting wide angle lenses made for cell phone cameras. 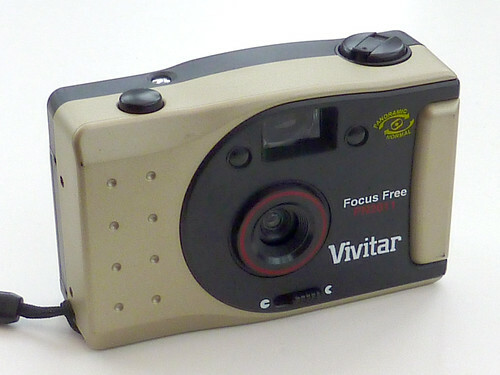 Most Vivitar PN2011 units have two tone champagne and black coloring but a small number are silver with translucent blue plastic in place of the black faceplace. 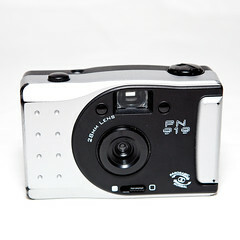 This camera was also sold as the SupaPix PN2011. Reader's Digest sold the same camera under the name Reader's Digest PN 919 Crash Camera, so named because they suggested carrying it in your car in case you needed to take photos as evidence for your insurance company after an auto accidence. Shutter speed fixed at 1/125s. Lens cover opens and closes via sliding switch.